Looking for bathroom design inspiration? 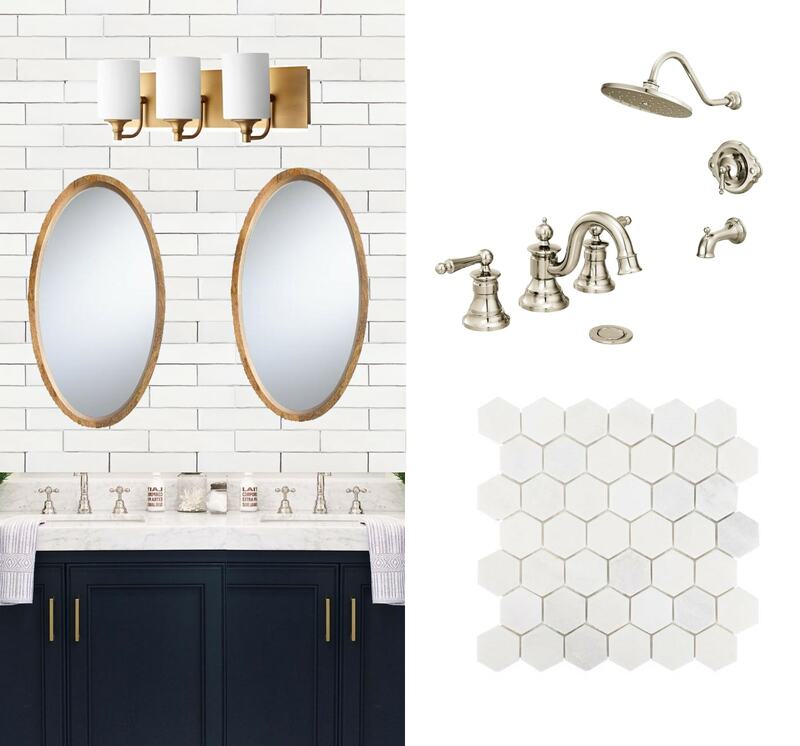 Get the design plans and sources for a chic navy and marble bathroom. There’s nothing quite like being almost 35 weeks pregnant and having no bathroom sinks. To be fair, I realize that it is totally one of those first world problems; we still have working sinks downstairs in the powder room and kitchen, and the toilets and baths are undisturbed upstairs. But bending over the bath faucet to brush my teeth and wash my face is becoming rather comical at this stage. 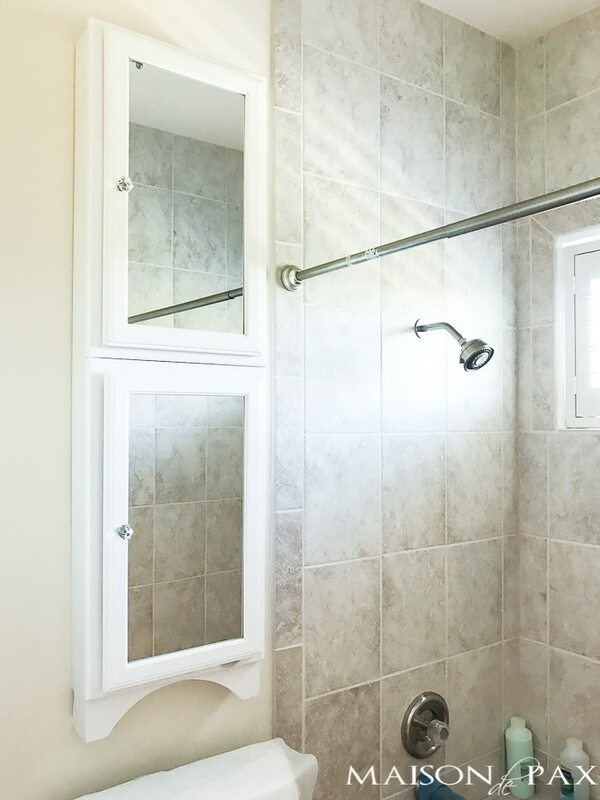 I shared a bit about the inspiration for our bathroom remodel here, but today I thought I’d give you some more direct design ideas. 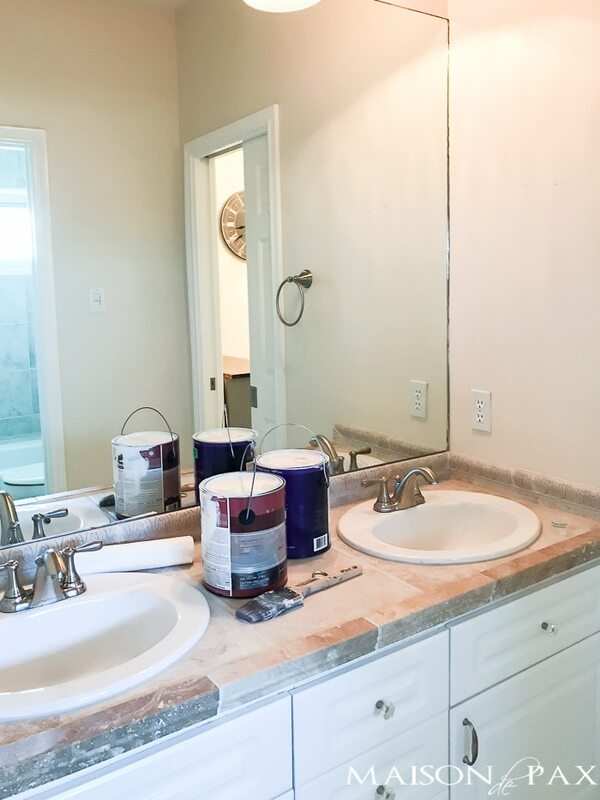 I also failed to mention that while we had contractors here doing the full renovation on the Jack ‘n Jill bath, we are having them replace the countertops in the other bathrooms with the extra material… hence the lack of sinks. The rest of the makeovers on those spaces will have to wait until after baby (I am showing some restraint here, friends! ), so I’ll have to ask you to be patient there. But I digress. 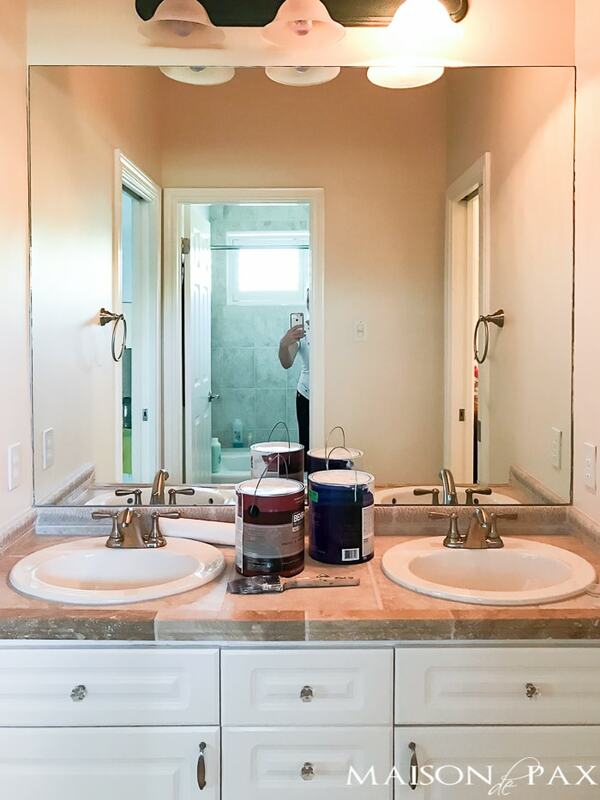 Here is what the bathroom looked like before (I’m sorry for the terrible before pics; I snapped these while I was in there painting the ceiling a few weeks ago). The layout is perfect for the two bedrooms that share it; the counterspace will be wonderful as it will be shared by our two girls (and used by guests when they come), the separate water closet is also great for a shared bath, but the faux travertine floors and walls and counters simply aren’t my style. And – I’ve confessed this before – I’m not a clean enough person for tile countertops. So here is what I’m imagining for the space. So far the only work that has been done is demo… So I won’t have any updates for a while. In fact, I’m planning to paint the cabinet myself, so it may have to wait until after my little maternity leave… But I promise a big reveal when the time comes. I for one can’t wait to see how it will really turn out! I think fun towels and a cute wooden stool for the girls to use are definite musts as far as accessories go. Any suggestions on a shower curtain for me? Let me know! Praying for you as you approach the due date. Very exciting! We have definitely seen a shift in the last few years with bathroom design. All of these trends are on point in our area except for the in floor heating. We are in a pretty warm area, so not much need for that here. 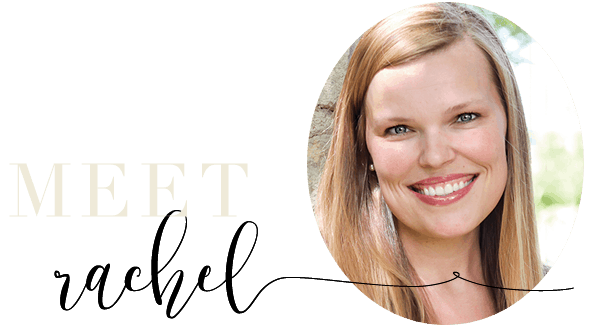 Thank you Rachel. It’s important for us contractors to keep up on all of the latest trends to better serve our clients. Laura- you are so welcome! I am glad it was helpful.